One bedroom, Two bathroom condo that sleeps 5 people. Oceanfront with views! 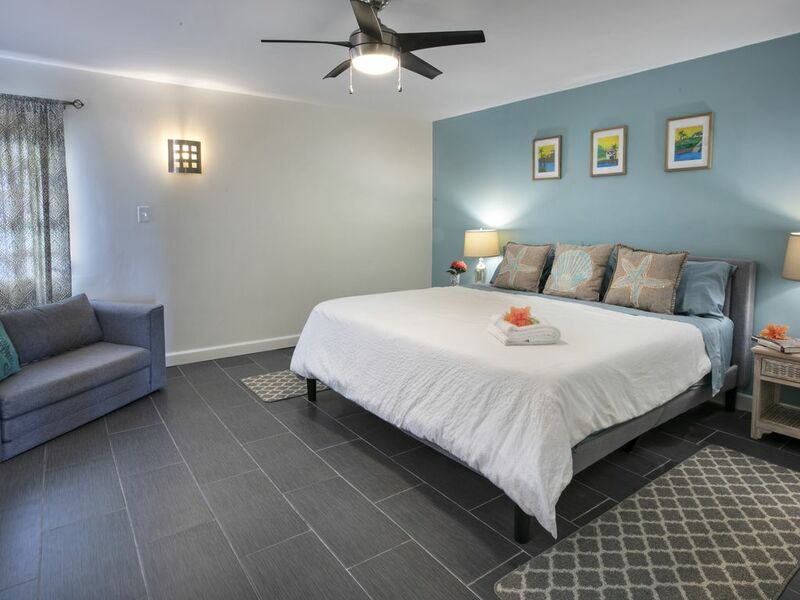 This newly remodeled one bedroom, two bathroom condo is located at Sapphire Beach. Sleeps 5 comfortably as we have a King sized bed in the bedroom, sofa that converts to a King size bed, and a twin sized convertible love seat. This condo is just steps away from the white sand and tranquil waters of Sapphire Bay. We are located on the East end of the island near the town of Red Hook. The location is perfect as it is walking distance to marina where you can book a sailing trip, BVI day trip, fishing, jet ski rental, and many other activities. This condo is located in the gated Sapphire Bay West condominium complex and is ideal for the perfect getaway. There is a pool, tennis courts, and laundry facility on site as well as beach chairs and lounges available to guests at the beach. We love the Caribbean and have traveled through most of the islands. We felt Saint Thomas was a place that we could come back to year after year so we purchased this home. We love the location and feel that you will too once you stay here. This condo is located on the East End of the island which is perfect as you are close to Red Hook and all that this town has to offer. There are restaurants, bars, and shopping, as well as the ferry terminal which allows access to Saint John and the British Virgin Islands. Our condo complex is right on Sapphire Beach which is so beautiful and offers great snorkeling and swimming, not to mention, views of many islands in the backdrop. A hair dryer is provided. Bath towels, hand towels, and washcloths are provided for up to five (5) guests. We are beachfront at Sapphire Beach and close to other beautiful beaches such as Coki beach and Lindquist Beach. Gated parking is available on site. Please go the the Condo office to obtain a parking pass for your stay. We provide free high-speed WiFi internet for your stay. Bath towels as well as beach towels are provided. The living room provides a sofa sleeper that is King size. Linens are provided for your stay. Plenty of dishes and utensils for up to 5 people. Kitchen is fully stocked with cooking essentials and tableware. Coffee maker, toaster, etc. There is ample room at the dining table for five people, as well as a table and four chairs on the patio. Full cable lineup provided, as well as a smart TV with access to all the latest apps including Netflix, Hulu, Amazon, etc. Various types of books to chose from. Many different board games, cards, etc. An enclosed patio with table and chairs are provided. A beautiful view of the beach and ocean can be seen from here. We have provided snorkel gear to use while you stay. If anything else is needed, there is a rental shack at the beach for additional beach toys. There are two tennis courts on site. A very large pool that is spacious and seldom used. The location is ideal for vacationers as the beach provides a rental shack for beach toys and other activities. The nearby marina and beach restaurant/bar are also convenient places to walk to. The town of Red Hook has everything else you may need including groceries, ferry terminal, restaurants and nightlife. You can take the taxi here for $1 per person!